We had a great time yesterday when the host and taping crew of Prairie Yard and Garden came to do a segment here at Leatherwood. Host, Larry Zilliox, is the well informed host of the show. He even told me how to deal with my tomato wilt while we were waiting for the cameras to get repositioned. Camermen Roger and Mike knew their stuff, too. Roger's been with the show since its inception 23 years ago. Mike and Roger both offer their technical expertise at the University of Minnesota Morris. Larry is a retired extension agent, Master Gardener and owner of a B & B near Alexandria. Nature provided a sunny afternoon as we had hoped for. The cameramen liked the bright sunlight and positioned us facing the sun for the best lighting. It was a little tricky for Roger and Mike to stand the cameras in amongst the herbs. I wish I had had my camera, then, to photograph the cameras standing in the mugwort and anise hyssop. 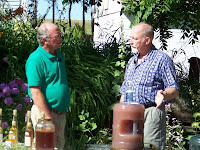 Larry and I talked about herbs, their traditional and modern uses, and how we use them to flavor the vinegars. Ron showed Larry details of the wine and vinegar process and demonstrated acid titration, his method for determining the acid content of finished vinegars. By late afternoon we were ready for a little break. I brought out some hummus and salsa verde, both made with lovage / chive in grape Leatherwood wine-vinegar and Ron opened a bottle of Leatherwood wild grape wine. The crew enjoyed the break (we did, too) and then Mike and Roger did some close-up shots of the herbs while Larry and I got better acquainted. Ron had to head back to work since he's helping a friend with his potato harvest. 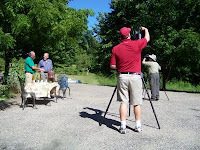 The Leatherwood Vinegary segment of Prairie Yard and Garden will be aired sometime between January and August of 2010. I'll try to let everyone know when the exact date of broadcast is determined and how to find it.